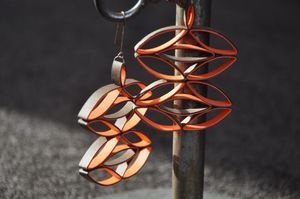 These earrings were created primarily using a stacked quilling tool. It is very easy to make and if you would like to make one for yourself so that your earrings come out exact, you can find the free tutorial here on the website. If you prefer not to do so, you can find a household cylindrical object or dowel that is the same diameter as I call for in the pattern These instructions also assume a basic understanding of quilling and creating the basic shapes. If you need to learn or brush up on your skills, you can find free instructions by following the link to the tutorial here. All of the designs in this tutorial call for two colors of 1/4" quilling paper. All examples given were made using paper from Quilled Creations. Color A represents the outside of each ring and color B is the inside. The exact paper cuts used will be provided alongside each individual design. *In this version, we will use both the .5" & 2" tiers of the stacked quilling form. Using the 2" tier of your stacked quilling form and 1 8.5" strip of color B, create a closed coil ring. Glue to secure the paper when you reach the end of the strip. Seamlessly join an 8.5" strip of color A. Glue when you reach the end. The ring is complete. Remove gently from the form. You will need 4 sets of 4 rings (16 total). Using the same 2" tier, make another ring using first an 8.5" strip of color A and then seamlessly joining an 8.5" strip of color B. Make 4 total. Make 2 closed coil rings using first a 4.25" strip of color B and the .5" tier of your stacked quilling form. Seamlessly join a 4.25" strip of color A to complete each ring. Shape all of the coil rings into marquis shapes. Take care to hide the outside paper seams (placing them at a point) so they will be less noticeable when the earring is finished. Glue 2 of the B/A marquis together. Match up the points without the paper edge. Place a small dot of glue between them and press to hold. Make 8 sets. Once the sets are dry, place a small strip of glue on the exposed points. Attach to another set as shown in the pictures below. Complete this process with all of the sets and allow them to dry completely before proceeding to the next step. Once the glue is dry, it is time to insert the A/B marquis shapes. Place a total of four small dots of glue on each upper outside point of the shape. If you allowed the glue to dry completely in the previous step, you will be able to squeeze the outside gently to widen the space in which the A/B marquis needs to be placed. Insert it carefully so you don't have a mess of glue. I will refer to this new grouping as a shape pod. Repeat with the remaining 3 pods. You will now need to connect two shape pods together. Place 4 small dots of glue on either side of the center joining line. Press two of the pods together and make sure all of the edges are in line. Place a small strip of glue along the center seam of one of the pods. Attach a small B/A ring to complete the earring. Once the glue is dry, you will want to seal your earrings to protect them from the elements. Instructions for finishing are provided at the bottom of this tutorial. Version # 2 - Single Mod Earrings. * The only differences in this version is you make only one shape pod and place the small marquis on the side seam instead of the center. Version # 3 - Double Side Mod Earrings. A) 20 x 8.5" strips, 2 x 4.25", 2 x 17" strips. * Made the same as the original double mod with the exception of the direction of the center marquis shape. I find it easier to attach either side to the center piece in this version instead of creating both sides and then inserting the center. * To make the top, first create 2 closed coils using your quilling tool. First roll up an 8.5" strip of color B. Glue to secure. Seamlessly join a 17" strip of color A. Glue to secure and remove from tool. Glue in place to the top center of your earring. Make a second smaller closed coil using first the 8.5" strip of color B and then the 4.25" strips of color A. Glue to the top of the previous coil and allow to dry. Version # 4 - Single Side Mod Earrings. * Made in the same fashion as one half of the Double Side Mod Earring. Create the coils to be placed on the side edge by using your quilling tool. Roll up first a 4.25" strip of color B and then join in a strip of color A. Glue to secure and place on the seam as shown in the picture above. You will want to seal your earrings to make them more durable, protect them from water and sunlight and brighten the paper up a bit. I choose to use a UV protectant nail enamel that I paint on by hand. The most important things to know about sealing are to not do it until the glue is completely dry, only finish in a ventilated area (or use a mask) and allow the sealer to dry completely as well before adding the hardware or wearing. I like to allow them to 'breath' for about 48 hours before wearing. Attach the O rings and ear wires using your jewelry pliers. I find it helpful to first stretch open the O rings and curve in each end to create more of an oval shape. This allows the O ring to slide into the closed coil more easily.